This is the shout-out and blog hop I’ve been waiting for: Thanksgiving! (Also, I realize it’s Saturday…sorry about that). Like many of you, Thanksgiving is my absolute favorite holiday of the year. It’s crisp fall weather, making a grocery list with my father, and getting odds and ends the day before. Thanksgiving is sleeping in and catching just the tail end of the Macy’s parade, scrambled eggs, and the smell of turkey roasting. It’s stuffing (Pepperidge Farm) and buttery mashed potatoes, green beans and cranberry sauce – from a can, with ridges (I brought real cranberry sauce once and it didn’t go over nearly as well). Dessert is Entenmann’s pumpkin pie and ice cream. Thanksgiving is dinner with my mother, father, and sister (it’s the one holiday my husband and I still spent separate, unable to break tradition), and being thankful that we are together. It’s watching Miracle on 34th Street as they show it on TV for the first time that season, and snoozing on the couch, too full to move. Now, unable to spend Thanksgiving at home, it’s when I miss my family the most. If you follow food media – blogs, magazines, newspapers, cooking shows – it’s hard not to be inspired this time of year. The internet is overflowing with turkey tips, easy sides, and make-ahead desserts. I’ve seen so many tempting Thanksgiving dishes this week my head is about to explode (in the best possible way of course) and I’ve bookmarked many to make another time, or another Thanksgiving. Here are some of the greatest Thanksgiving recipes and ideas I’ve seen on the web this week. 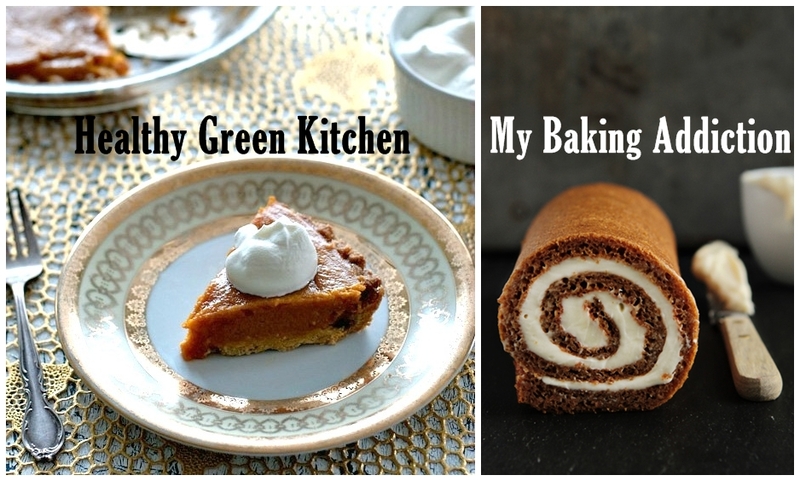 I’d love if you shared your favorite Thanksgiving recipes in the blog hop below! You may have seen my own post this week for Oolong-Brined Turkey Breast, which would make an excellent Thanksgiving main for anyone looking to cut out the hassle and mess of roasting a whole bird. Flavorful and easy, one of these easily serves four people and it’s an excellent use for that tea you have sitting on your shelf. For another very different variation on this, Simply Budgeted made a Sweet Tea-Brined Chicken, which I think would also make a nice Thanksgiving alternative as well (and would probably be lovely with turkey too!). If you are looking for a traditional roast turkey recipe, then head straight over to Cookin’ Canuck. Dara has perfected the art of the Thanksgiving bird, which she accompanies with herb butter and roasted shallots. I don’t think I’ve ever seen a more beautiful roast turkey. For the first time this year I’ve noticed two distinct camps on basting. Conventional wisdom, followed by Cookin’ Canuck and The Kitchn in their helpful How to Roast a Turkey post, says that basting is the secret to a tender bird with crisp skin. But in her Eatocracy article “Five Things NOT To Do When Roasting Your Thanksgiving Turkey,” Melissa Clark turns this on its head. Which leaves the question: To baste or not to baste? Of course you can’t have turkey without gravy and I just love Brown Eyed Baker’s Make-Ahead Homemade Gravy! She takes the last minute stress out of making gravy from drippings while everyone waits hungry by preparing it ahead with stock, cream, and brandy. If you are looking for a vegetarian main to serve then forget the Tofurkey and head straight for Veggie Belly’s elegant Tofu Skin Roulade with Sage Mushroom Stuffing. This creative, beautiful dish has all the elements one could want in a Thanksgiving dish, without the meat. Then there are the sides. Oh, the sides! Panini Happy has come up with yet another creative use for her panini maker with Grilled Acorn Squash with Cranberry-Ginger Maple Syrup. Ingredients, inc. meanwhile takes one of my favorite veggies – brussels sprouts – and makes a gorgeous salad with cranberries and walnuts. Instead of stuffing how about a savory bread pudding? I absolutely love Blue Kale Road’s Butternut Squash and Leek Bread Pudding as well as A Communal Table’s Cheese and Herb Bread Pudding. And what Thanksgiving table is complete without biscuits? Barbara over at Creative Culinary has really hit the nail on the head with her gorgeous Sage and Caramelized Shallot Brown Butter on Pumpkin and Sage Biscuits. I am a sucker for Thanksgiving desserts and have been drooling over some of the recipes I’ve spotted this week. I absolutely love good old fashioned pumpkin pie and can’t wait to try this recipe over at The Mom Chef. Or, for a delectable variation check out Healthy Green Kitchen’s Red Kuri Squash Pie! If pie isn’t your thing then never fear. Consider instead My Baking Addiction’s Pumpkin Roll, That Skinny Chick Can Bake’s Mini Pimpkin Bundt Cakes with Cream Cheese Drizzle, or Gluten-Free Cat’s GF Pumpkin Dessert. Best round up yet. Probably cause Im in love with Thanksgiving! regarding your basting debate, its quite simple. you can’t baste and put stuffing in the bird. it shouldn’t even be a debate. as for another recipe to add to the list….i’ve always made what I call the Paul Simon turkey. You stuff the inside of the skin with chopped up parsley, sage, rosemary and thyme (and garlic). sooo good. i can’t wait for thanksgiving! Thanks for chiming in on the debate! Good point about the stuffing. Although I actually prefer to prepare my stuffing outside the bird. 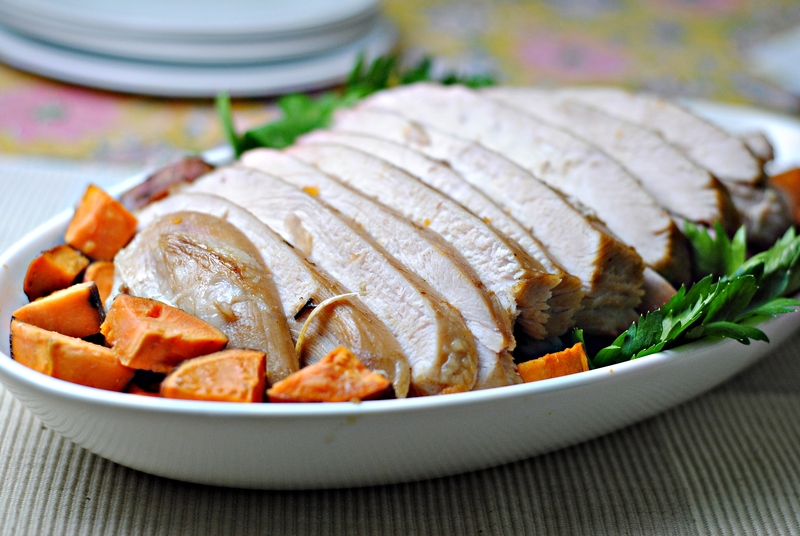 I love your Paul Simon turkey – both the name and the ingredients! Sounds absolutely delicious! Man, I love Thanksgiving! Great collection! I just brined a turkey and, while it was definitely moist, I’m not convinced it’s worth the extra time and hassle. Just roast slow, baste, like my grandma. What a wonderful round-up. I love Thanksgiving, too – especially since my bday falls on it every 6 years! Thank you Lynda! And that is so great. Happy almost birthday! Excellent Round -Up, such mouth-watering and gorgeous photos! Thank you Lisa! So many great recipes out there! 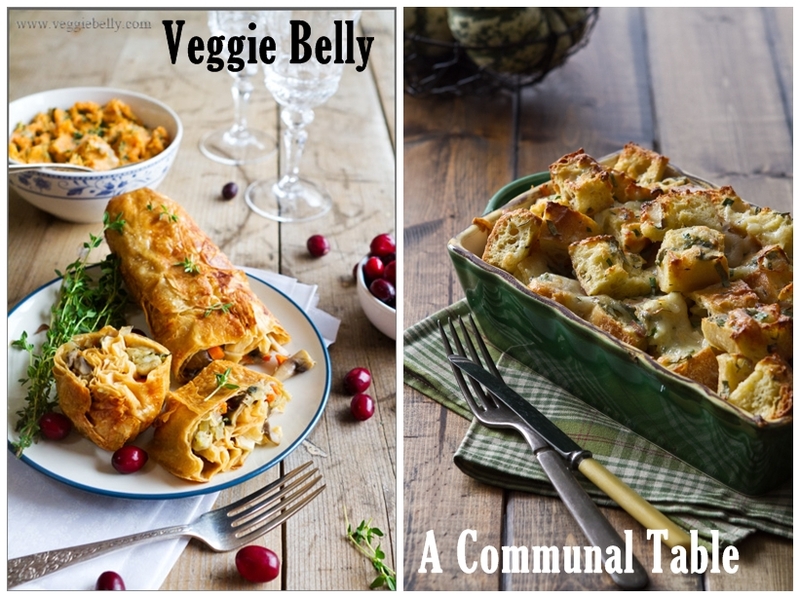 Excellent round up of recipes – thank you so much for including my savory bread pudding!! Ben makes a great point. Also it depends upon the preparation of the turkey as well. I make a compound butter (with fresh herbs) that I slather under the skin and on top. Find I really don’t need to baste the turkey to get crispy skin and juicy meat but with other recipes I’ve found it necessary! Don’t you just love these simple answers?? LOL! Nancy, it is my pleasure. I love your blog! And I can’t wait to make your bread pudding – it looks SO good! You make a great point about not needing to baste when you slather butter under the skin – I’m a huge fan of this method! Happy Thanksgiving to you as well! This looks absolutely fantastic..love your round up! everything is so delicious!!! Lovely round up! It must be hard to be so far away from your family but hope you will still have a nice Thanksgiving. Perfect timing! Everything looks so yummy. Happy Thanksgiving to everyone. Happy Thanksgiving to you as well! I can’t wait to make all of these recipes…! Hello Katherine, thanksgiving day is a new thing for me, I had my first thanksgiving dinner this year on October 10 (Canada s thanksgiving day). I love this column of shout out and blog hop, and this one has all the festive recipes I love! I hope that next year you’ll have your thanksgiving dinner with your family..
How wonderful that you got to celebrate your first Thanksgiving! Isn’t it a wonderful holiday? I mean, it’s all about gathering with people you love over a huge meal. What could be bad? I’m so glad you like this series 🙂 I probably won’t be able to have Thanksgiving with my family next year either, but definitely the year after! What a great shoutout! I’ve seen a couple of these, but missed some so thanks for doing this! I always make giblet gravy because that’s what my family likes, but I’m not crazy about it. Brown-eye’s gravy might be a compromise this year. 🙂 Have a very Happy Thanksgiving! Thanks! I am so happy you found a few recipes here. Also, I totally meant to include your pumpkin and chestnut soup, not sure what happened! That would make another amazing addition to the Thanksgiving table 🙂 Happy Thanksgiving to you and your family! Awesome round up here. I really like these because it is hard to get around to all the posts and there are some new ones here that I am very interested in. Thanks for doing this blog hop and have a wonderful holiday! Just beautiful! I can’t wait for Thanksgiving! Thanksgiving is my favorite holiday, too, and my family dinner always included Pepperidge Farm stuffing and canned cranberry sauce. Even though I make cranberry sauce now, we still have to have a canned sauce sliced on the table for my Dad. Some traditions are very hard to change! Your round-up of recipes has me so excited for Thanksgiving! Thank you for including me. There are some terrific recipes here I’ve bookmarked to try…sigh, if only Thanksgiving lasted more than one day. Happy Thanksgiving! I’m intrigued by the Oolong turkey. I’ve got to try it. Happy Thanksgiving and thank you for sharing. I wrote down a couple blogs for side dishes, especially brussel sprouts. Thanks for a good, extensive blog list. It gives me a chance to discover other blogs through you! Oh good! I am so happy that this has proven useful 🙂 There are so many great recipes I hardly know where to begin! Great round up – so many choices and so little time. Thankfully i am not hosting this year just bringing a bunch of dishes to my sister-in law. Making Ribs and side vegetable/salad. Thanks Ewa! I know, I feel the same way! That’s great that you can relax a little and just bring a few things. Mmmm ribs. Thanksgiving is my absolute favorite holiday of the year! I’m so excited to browse through all of the links on your hop 🙂 I linked up my cranberry sauce yesterday and my favorite turkey day dish (applesauce) today. Thanks so much for the great resource! Me too!!! I’m so happy this is proving to me a good resource, I love what people have linked up. Thanks for linking up your recipes – they look great! !